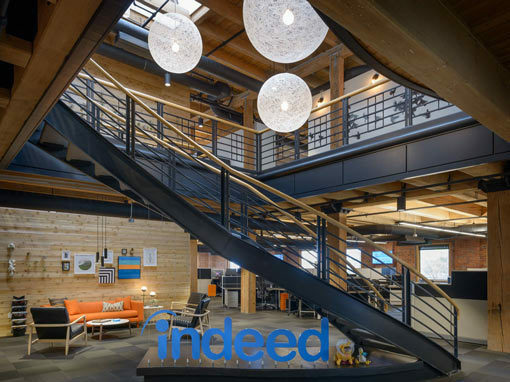 Indeed’s Seattle office is located in the Waterfront district, downtown, in a 1920s building which exudes character. 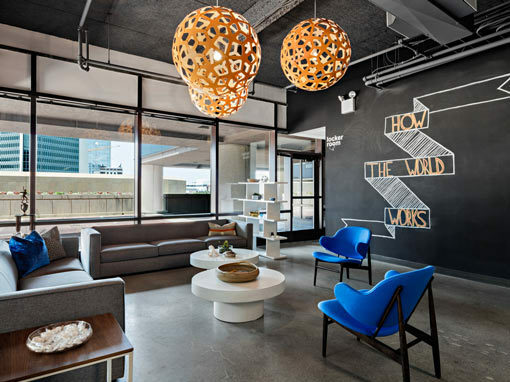 The building features exposed brick walls, wooden beams, and 360 degree city views, including an unobstructed sightline to Seattle’s Great Wheel. 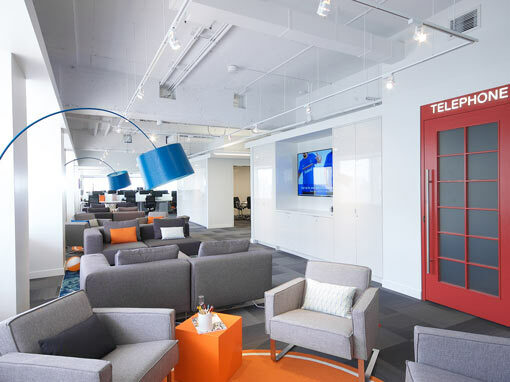 We chose black, gray, and white for lighting and desk finishes and popped Indeed’s orange and blue corporate colors around the office. The 30-foot horizontal, wooden feature wall supports two kitchens and creates a dramatic space divider and focal point for both floors. On the 5th floor, guests enter a rather dramatic scene as they are greeted by a large, black, spiral staircase and giant, white, spherical pendants. The lobby feels more like a living room, where guests can sit down, read a magazine, and enjoy a cup of coffee from the coffee bar on the opposite wall. 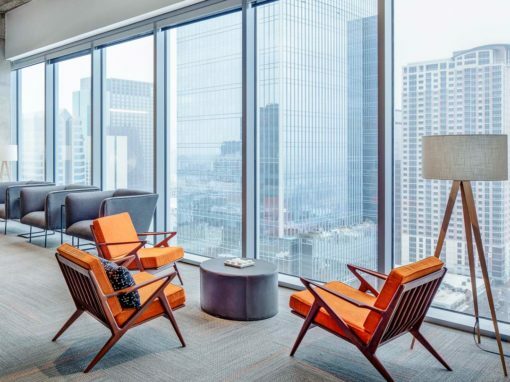 We created a number of alternative cozy seating areas for employees to retreat to for inspiration. 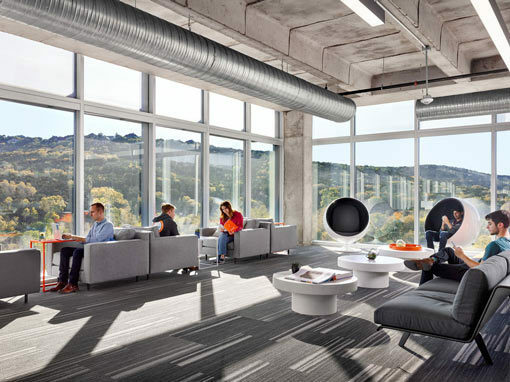 Since the 6th floor didn’t require any individual desks, it is encompassed by conference rooms, a kitchen and dining hall, a game room, and a bar-like lounge area. It features a wall covering of a flight of black birds which wrap the central conference room. Opposite that feature, is a large map with clocks hung to represent Indeed’s office locations all around the world. We created a ‘bar lounge’ using more luxurious materials such as tufted leather, copper tiles and woven fabrics. 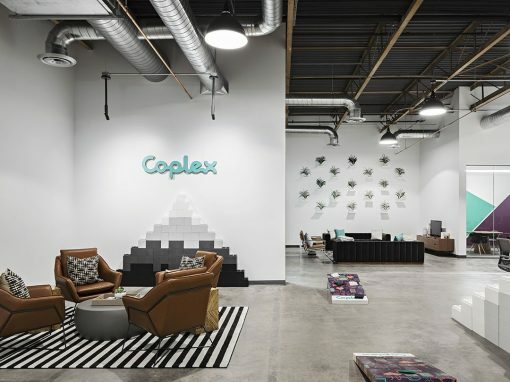 We thought the feature wall was the perfect place to create the company’s logo with air plants. Bringing in a reference to nature in the interior design—with both the air plants and wall coverings—was intentional, as we felt it is reflective of Seattle’s way of life. 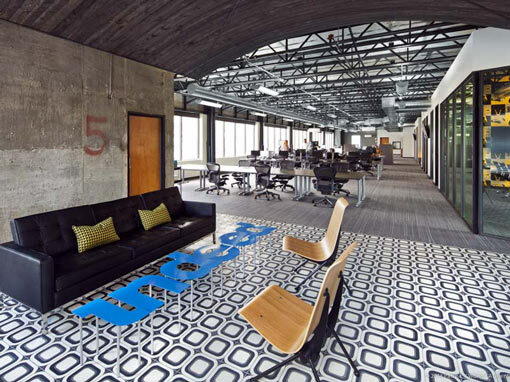 Indeed’s Seattle office is the perfect place for engineers to create and be inspired. 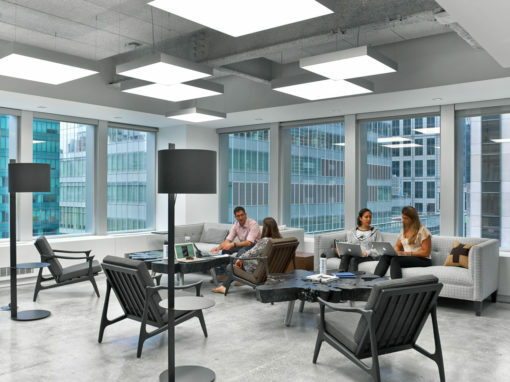 When we finished the project, we could tell that the employees felt like this work space was a second home. The Nerf guns and remote control helicopters proved that they were having fun in the space! 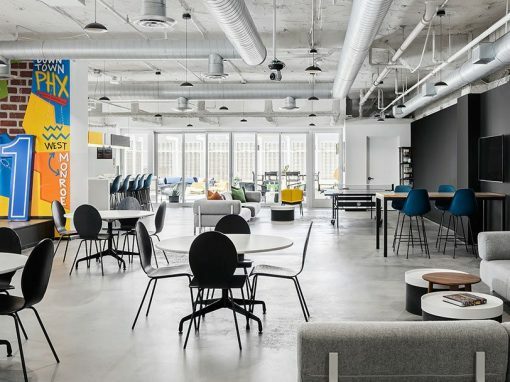 As we have done in Indeed’s other offices, we were able to bring the comforts of residential design to the commercial setting, creating spaces that are both aesthetically pleasing and functional. 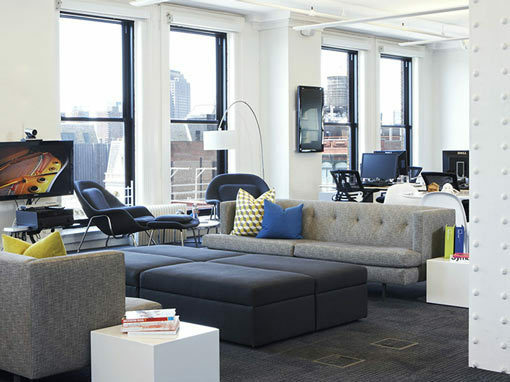 We are honored to have created an inspiring work space for another amazing company.